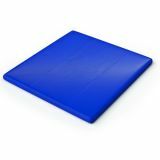 Soft, durable and well-constructed, this blue floor pad fits perfectly in the Toddler Play House Cube to provide cushioning and comfort for a toddler's private reading and play area. 22.75"D x 21.25"W x 1" thick. 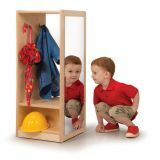 This all-in-one unit features three storage units on one side for toys, shoes and dramatic-play items; a deep bottom with sides; a sturdy wood dowel for hanging clothes and costumes; and an acrylic mirror for dramatic play. Baltic birch construction with a clear acrylic top-coat guarantees years of use. Some assembly required. 36"W x 14"D x 42"H. Weight 37 lbs. Down under or up above, this unit will be the center of activity for the two and under gang! The 18" height and triangular design provides a stable base for pull-up-and-walk-around first steppers. Top shelf is recessed 1/2” and bottom section features see-me mirrors. Constructed from strong, 11-ply birch veneer with rounded corners and edges for safety. 36"W x 16"D x 18"H. Weight 33 lbs. 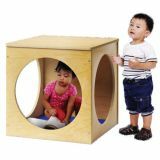 This new version of the Play House Cube is sized perfectly for a toddler to play, read or curl up and nap. Set it up with a roof over head, or turn it over and leave it open at the top. Add the Blue Floor Mat sold separately. 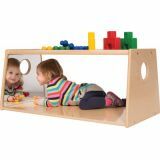 Constructed in beautiful, durable birch plywood in safe, non-toxic natural UV finish that won't fade and withstands rigorous use by children. Dimensions: 23.5"W x 24 3/4"D x 23.5"H, weighs 22 lbs.